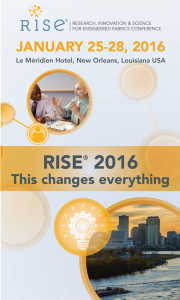 Cary, NC – Nov. 30, 2015 – The future in engineered fabrics technology, materials, and markets will be seen at INDA’s Research, Innovation & Science for Engineered Fabrics (RISE®) when the annual conference focused on “what’s next” comes to the Big Easy. INDA announced highlights of the technical presentations to be given by leading edge speakers Jan. 25-28, 2016, at Le Meridien Hotel in New Orleans. Online registration for RISE® is open on the INDA website. Entering its sixth year, RISE® is devoted to business/product development professionals, innovation teams, product manager’s research engineers, and other technical scouts charged with staying abreast of new technologies that could enhance their own. RISE® is for those seeking technical presentations centered on developing and driving innovation and technology within engineered fabrics. From presentations looking at the potential for using milkweed in nonwoven products to developing materials that can self-heal and recycling carbon fibers, this conference will explore the latest game-changing research, innovation, and science related to engineered fabrics. Where do we go from here in wet-laid forming? Presented by Alexander A. Koukoulas, Ph.D., President, CEO, Georgia Southern University, Herty Advanced Materials Development Center. Hear how demand for sustainable and renewable fiber sources may present new life for this technology. What’s next for energy and the economy? Peter Ricchiuti, Assistant Dean of Business School/Professor, Tulane University, will share his outlook on how energy will impact manufacturing. The founder of Tulane’s nationally acclaimed Burkenroad Reports student stock research program, Ricchiuti is the author of “Stocks Under Rocks” and hosts a weekly business radio show. The Future for Raw Materials for Nonwovens. Chuck Carr, Director of Propylene Studies, IHS Chemical, will offer a glimpse at what the future may hold as the Shale Gas Revolution changes the petrochemical landscape. INDA also is seeking nominations from companies of innovative nonwoven products and technologies for its RISE® Durable Product Award. The award is given to a durable nonwoven product chosen for its innovative use of nonwoven fabric and/or technology that is commercially sold and used in the consumer or industrial marketplace. Other RISE® event highlights include a welcome reception, “Dinner with an Industry Thought Leader”, plus scheduled networking opportunities to connect with 100-plus attendees; and connecting with more than 20 product exhibits.